MICROSOFT has made its highly successful Kinect gesture and voice command system available for desktop PC's from today. Until today, the Kinect sensor was available only on the Xbox 360 games console and its use was mainly for gesturing with games and controlling the Xbox interface. While the public is unlikely to clamour to use gestures for everyday activities such as loading their email client, or searching with their browser, Kinect on desktop PC’s could come in handy for everything from games to manipulating 3D models with gestures to collaborating in data rooms, Minority Report style. Microsoft’s move to make its software development kit (SDK) and runtime drivers for Kinect available for download from today honours a pledge made by chief executive Steve Ballmer who announced the February 1 release at the Consumer Electronics Show in Las Vegas early last month. The new SDK and runtime module replaces Beta 2 software made available three months ago. The release was announced on Microsoft’s blog by Kinect for Windows general manager Craig Eisler. 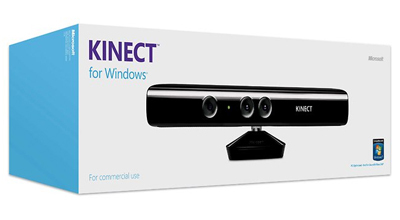 Current Kinnect units for the Xbox 360 are understood to work with Kinect for PC’s, however the PC-specific units would be calibrated for close-up use rather than loungeroom gesturing. Australia is among the twelve listed countries for new Kinect PC hardware which also include the US, Canada, France, Germany, Ireland, Italy, Japan, Mexico, New Zealand, Spain, and the UK. Eisler nominated a retail price of $US249 for the new Kinect unit. However Microsoft Australia confirmed today that Australian users would be charged $50 more for the device, despite the value of the Australian dollar being well over parity. Eisler said Microsoft had made many improvements to the Kinect SDK and runtime module in the three months since the Beta 2 release. They included support for up to four Kinect sensors plugged into the same computer, significantly improved skeletal tracking, including the ability for developers to control which user is being tracked by the sensor, and a near mode for the new Kinect for Windows hardware. This near mode would enable the depth camera to see objects as close as 40 centimetres in front of the device. Updated Microsoft speech components were included as part of the SDK and runtime installer. Microsoft said it also had worked to improve the accuracy of its speech recognition, which has been a problem even at demonstrations of Kinect to the media, including during Mr Ballmer’s presentation at CES. An improved “far-talk” acoustic model had been developed to improve it, Eisler said in his blog. Microsoft also is understood to be working with manufacturers to build Kinect sensors into laptops.